I came home last night after watching Cloverfield and went on a cleaning/organizing spree that started with the dishes, then proceeded to the kitchen, and ended with my staying up all night going through all my finances since I got here. 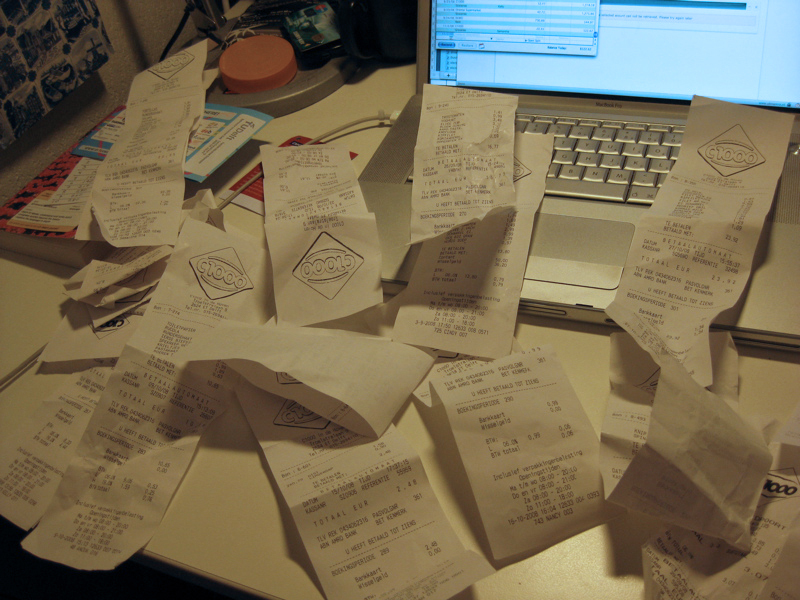 The picture below is just a few receipts from my frequent grocery runs to C1000, one of the three supermarkets in my area. I also realized that I could also keep track of the cashiers’ names and started a tally of who has served me the most. (Hallo Seborah.) Cindy and Jeanne are tied for second. I started trying to diversify my cashier when I was going there more than three times a week. I also caved and paid for a flickr account so I can show more pictures in a pretty fashion that isn’t facebook-dependent. Like watching a baby learn to walk, maybe you’ll see some more sophisticated photo management out of me in the future. I uploaded other photos from the Donald Norman excursion (it was held in the Design Huis of Eindhoven, so there were some exhibits to see), and I also put up pictures from my Domestic Appliances inspirational dinner last Wednesday after a product imaging workshop with Philips. At this phase of the class, we are developing individual concepts based on the research we did as a group in the first quarter. To test out and learn more about some of our concepts, my group held a long-due inspirational dinner. Ivo (glasses) is making a tofu squeezer and marinater, Elliot (plaid shirt) is interested in making steaming more accessible, and Suyanto (last guy) is interested in increasing nutritional knowledge and balanced eating. We kind of failed to steam anything, but we did make tofu, sushi, noodles, green beans, and ice cream with fruit chunks and pineapple glaze.